The Solstice Cardinal brought me gaming gift called Killer Bunnies and the Quest for the Magic Carrot. 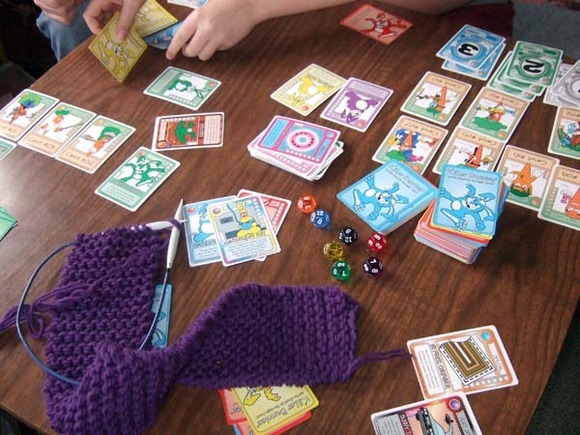 It’s a silly, fun card game with a number of different aspects that make it quite interesting. Basically, you try to keep get lots of Carrot Cards, so that you have a good chance of having the “winning carrot,” which determined randomly at the end of the game by a die roll. You try to keep your bunnies alive while ruthlessly eliminating your opponents’ bunnies. And there are numerous expansion packs. The very best part, though, is that Beloved Wife enjoys the game! So that makes it a keeper. She even mentioned it in her blog. This entry was posted in Life and tagged Family, Fun, Gaming on January 20, 2009 by Geoff.